Once a commerical property the old concrete basement was removed over a year ago and this summer a new wood basement was erected on the site across the street and a block East of NuForm Packaging. 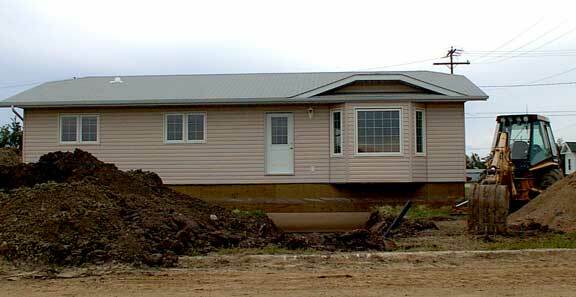 Tuesday, a smart looking RTM (ready to move) was fitted to that basement and we have the seventh new dwelling for this summer in Tisdale. Two new homes on NewMarket, one of which is in the new sub-division, two houses moved into town on the South part of town and the two unit but extensive condominium duplex on the former primary school yard. With the other commerical and community buildings and the renovations of homes and the Credit Union Tisdale is seeing a good deal of construction for this year, on par with last year at this time and this is despite still a fairly sizeable number of houses still on the market for sale.